Married Dianne Deeken class of 1969 in 1973, two daughters. 5 grand kids, 2 boys and 3 girls, two are teens this year. Wow! I'm a very blessed man. God is good! 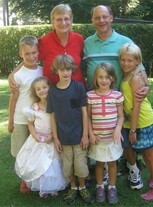 Profile pic is Dianne & me with our 5 grand kids taken in 2014. They're all so much bigger today, growing like weeds. Curtis was a great experience, met many wonderful people. Now 50 years later my eldest grandson is a freshman at Curtis. Happy to hear all the good reports of classmates doing well. Enjoyed my years at Curtis, although I cut out way too much - always on the lookout for WinChester Sellitto. Steve Gibson updated his profile. View. Steve Gibson added a comment on his Profile. Steve Gibson posted a message. New comment added. Hi Elizabeth, Hard to believe it's been 50 years! Glad to see you. Steve Gibson added a photo to his profile gallery. New comment added. Steve Gibson posted a message. Hi Valerie, welcome to the site. Like your comment re: your grandchildren; they are indeed an awesome blessing at this stage of our lives. I'm remembering your cute endearment for friend Grace R. After all these years, I still can't pronounce it though. Steve Gibson changed his profile picture. New comment added. Steve Gibson has left an In Memory comment for Penelope Fortune. I knew your mom more from a distance; she was in some of my classes and I would see her often in congregating areas. Penny was one of those beautiful people, always with a warm engaging smile! She was nice. In those days, some of us weren't in the "in-crowd" but Penny, as everyone called her, was nice to everyone regardless of station. Without looking at yearbook photos, I'm still able to see Penelope's smiling face. She made a wonderful impression on us, her classmates -- and we just loved her name!!! A beautiful light out so young. So sad. My condolences to you Douglas, her family, and to everyone she loved and smiled upon.